In 1540 AD Cherokee people met European men for the first time. 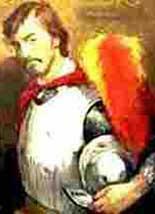 A Spanish man named Hernando De Soto was exploring the East Coast of North America with a group of Spanish soldiers. Soon he arrived at Cherokee towns. Cherokee leaders welcomed the foreigners diplomatically, even though they must have known that De Soto and his men had been killing and enslaving other Native Americans nearby. This worked for a while. But then De Soto tried to make the leaders of the Cherokee give him all their gold and silver, and tell him where the gold and silver mines were. De Soto thought all of North America was just covered in gold and silver treasure. But he was wrong. The Cherokee chiefs could not understand what he wanted. They didn’t have any gold or silver. De Soto got very angry and killed some of the Cherokee men. He took other men and women away to be slaves for the Spanish men. In the fall of 1566, another group of Spanish invaders traveled around the Cherokees’ land. The Cherokee treated this group well too. Probably many people died of smallpox caught from De Soto’s men during this time, but there are no records of it. What kind of sickness was smallpox? In 1654, Cherokee people met their first English people. It didn’t go any better than it had with the Spanish. Cherokee people had a town where Richmond, Virginia is now. The English settlers in Virginia didn’t want the Cherokee there. The English attacked the Cherokee, but after a bloody battle the Cherokee won. So the English had to leave their town alone. Why were these English people coming? The Cherokee traded with the Spanish settlements near them. And by the 1670s, thanks to Queen Mariana of Spain, all the Cherokee fighters had guns. In 1660 a lot of Shawnee people came south, driven out by their Iroquois neighbors. The Cherokee let these Shawnee settle on the edges of their land, to protect them from attacks. But the Shawnee ended up fighting with the Cherokee. Where were the Shawnee from? What’s up with the Iroquois? At first the Cherokee army was much stronger than the invading European armies. The Cherokee made trade agreements with the English in 1684. They started trading deerskins and enslaving other Native American people (like their neighbors, the Creek people) to sell to English traders. In exchange, Cherokee traders bought guns, metal tools like hoes, and farm animals like sheep, cows, chickens and pigs. But in 1715 many Cherokee people died of another epidemic of smallpox – probably more than half of the people died! Then their army was much weaker. Cherokee leaders had to make treaties with the English Queen Anne. 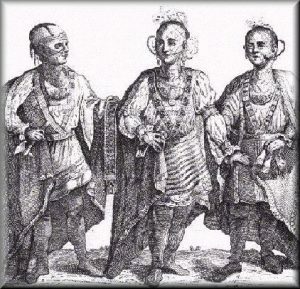 Seven young Cherokee men sailed to England in the 1730s AD to meet King George II of England. One of these Cherokee men was Oukanaekah. They signed trade treaties with the English government and agreed to be friendly with England. But to the English, these meetings just showed how powerful the English were. They didn’t take the agreements seriously. In 1756, the Cherokees lived up to their treaties with the English by fighting on the side of the English against the French during the Seven Years War. But the English settlers in Virginia and Tennessee ended up fighting with the Cherokees, and many people were killed. Then the Cherokee were at war with the English. 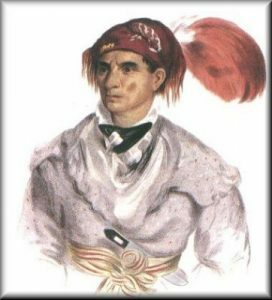 Finally in 1762 the English sent so many troops into Cherokee territory that the Cherokee, under their chief Ostenaco and other men, had to give up and make peace. What was the Seven Years’ War about? Later in 1762 three of these Cherokee chiefs, Cumnacatogue and Ostenaco and another man called Pouting Pigeon, sailed to England to meet with England’s Prime Minister, William Pitt. Again the English didn’t really take the Cherokee seriously. Because there were more and more English settlers in Virginia, more and more Cherokee people moved south and west into Choctaw and Chickasaw land. So Choctaw and Chickasaw people had to move south and west also. By the time of the American Revolution, the Cherokee were angry about having to move, and so they took the side of England in the Revolution. After the war, the new United States government was angry because the Cherokee had fought for England in the Revolutionary War. By the 1790s, the United States was determined to get the Cherokee people’s land. They started to sell lots of things to Cherokee chiefs, like clothes, food, beads, and tools. They encouraged the chiefs to buy more than they could afford, so that the chiefs owed the United States government a lot of money. Then the United States government insisted that the Cherokees pay up, and forced the Cherokees to pay in land, instead of in money or in furs or something else. The United States would only take land. And the Cherokee weren’t strong enough anymore to fight a war. So little by little the Cherokees had to give up their land to the United States. After this, some Cherokee people decided to live more like the Europeans. They published newspapers, got English educations, became Christians, and lived in English style houses. 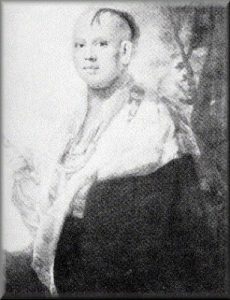 Joseph Vann, for example, was a Cherokee man who took an English name and owned a big farm in Georgia where he lived like Englishmen and forced hundreds of African people to work on his farm as slaves. 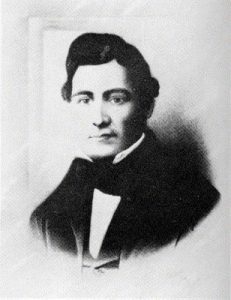 Joseph Vann was not an enemy of his Cherokee people (neither the Americans nor the Cherokee saw anything wrong with slavery), but instead was a good friend of a Cherokee chief, John Ross. John Ross often sent Joseph Vann to Washington to talk to the United States government about the business of the tribe. Joseph Vann was the second richest man in the United States. But even when Cherokee people tried to be like other Americans, the United States did not treat them fairly. Cherokee men couldn’t vote, for one thing. 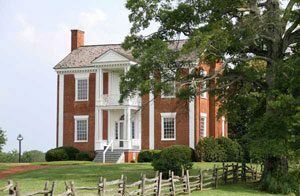 In 1833, William Bishop of the Georgia Guard (the army of Georgia) took Joseph Vann’s house and farm from him by force, without paying for them. About this time, the United States government decided that it would move all the Cherokee people from their own land in the south-eastern part of North America (Georgia and Arkansas) further west, where there were not so many white settlers yet. But the land was not as good in the West, and many Cherokee people did not want to move. There were fights between the Cherokee people who thought they should move, and the ones who wanted to stay and fight for their land. And there were wars between the Cherokee army and the United States Army, and the army of the Republic of Texas. Tah-Chee was one of the leaders of these wars. But the Cherokee army gradually lost these wars. By the middle of the 1840s, under Andrew Jackson, most of the Cherokee people had to move west to Indian Territory in what is now Oklahoma and Kansas. The way they took, walking west to Indian Territory, is called the Trail of Tears, because so many people cried as they were walking because they were so sad. Once they got to Oklahoma, Cherokee people worked hard to make a new life for themselves. They built schools, and a college. They installed the first telephone west of the Mississippi River. Many Cherokee people married Europeans or African-Americans. But when Oklahoma became a state, in 1907, the white government forced Cherokee kids (and African American kids too) to go to much worse schools, where they barely got any education. Cherokee people couldn’t vote, so they couldn’t get a fair government. Most of them couldn’t vote until 1965, after the Civil Rights Act, and even today, Cherokee people in Oklahoma struggle to be allowed to vote. Today most Cherokee people live in Oklahoma, on their own land, the Cherokee Nation. Another large group of Cherokee people live on their own land in western North Carolina. In Oklahoma, many Cherokee are unemployed; others work for low wages in nurseries or processing chicken, but Cherokee people continue to hunt and gather as much as they can. Did you find out what you wanted to know about the Cherokee Trail of Tears? Let us know in the comments! Cite this page: Carr, K.E. Cherokee Trail of Tears – American history. Quatr.us Study Guides, August 12, 2017. Web. April 21, 2019. Wolf Creek Cherokee Tribe of Virginia. Do you belong to that tribe? Welcome, and thanks for visiting! And I’m so glad you liked it!